By using Rapid Application Development (RAD) technology and methodology we are building the next generation of web sites that deliver higher response rates, greater customer interaction helping you to build stronger online relationships with your clients and customers. 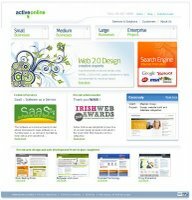 finalist in the category of 'best new web application' in the Irish Web Awards 2008. BOOKMEETINGROOM.COM was developed by WDI (Web Design Ireland) on behalf of a private client. A boutique RAD (Rapid Application Development company) , WDI provides enterprise applicationdevelopment capability to start-ups and established business clients within the EU. With offices in Dublin, Ireland, WDI offers attractive low-corporate tax SaaS operational and development facilities to companies within the EU and outside. Web Design Ireland (WDI) is a specialist web design and application development company offering custom designed corporate websites that are fully optimised (SEO) for good ranking performance in search engines (Google SEO specialist) as well as being an effective online marketing resource to drive online sales. Utilising agile development methods and the latest in UI/UX experience to create dynamic and effective websites for corporate use, WDI also has the capability of producing enterprise grade web applications under a rapid application development model to reduce development costs and get to market with your concept quickly.